In my 65 years of exploring this planet, no place has compared equally to a remote patch of California desert known as Saline Valley. 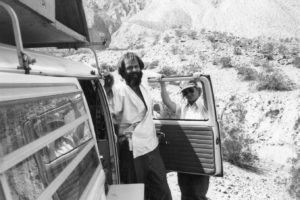 At the time of this embarkment into a literary exploration of its unique qualities, I have been in a deep relationship with this valley for 37 years, and the valley has had the most profound impact on my life as any other place I have come across. 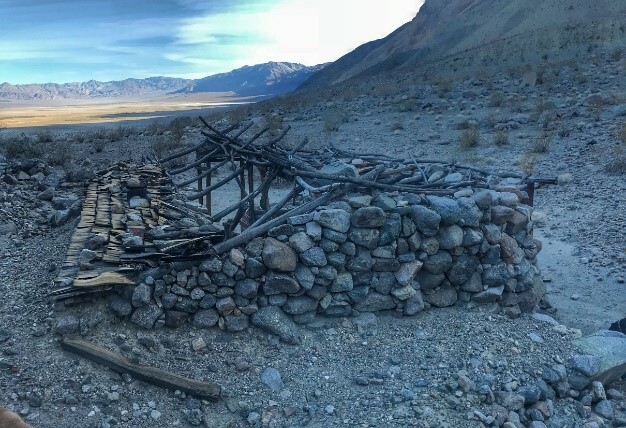 As timeless as this remote valley is relative to geologic processes, the cultural landscape has undergone a tremendous change since becoming part of Death Valley National Park in 1994. Upon a recent visit I started to relate some of the “old” stories of yesteryear. At that time, I was strongly encouraged to transcribe my stories into a written record of recollections for all to enjoy. I have been asked to engage in this endeavor many times throughout the years. My reservation has been that, in fact, I remember but a fraction of my experiences while visiting, or living in the valley. What I do remember is laughing a lot! Often, I will run into a friend or acquaintance who relates a shared experience or asks, “Do you remember when we …?” For the life of me, I can’t remember many of these memories, but they lead me to believe I must have lived a very interesting life based on eye-witness accounts. There has been a lot of change in the cultural landscape of the valley over the course of my tenure. I believe it would be valuable to some, and entertaining to others to try to preserve some historical perspective on this special corner of the world. 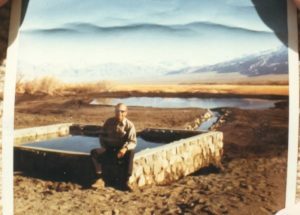 To that end, I have decided to take up the “pen” and begin the difficult task of transcribing tales and details of some of the history of Saline Valley. Though I have been involved in the valley for 37 years, while some consider me to be an “old-timer” I still count myself as a relative new comer compared with many friends. The best I can do is chip away bit by bit by sharing what I do recall, and what I feel might be important, in the hopes that by tapping into the dike, a trickle might lead to a flow, and perhaps a flood. I would like to invite those with clarifications or stories to add and contribute to what may eventually become a treatise, and the Saline Chronicles might evolve into Saline Noir. some ambiguous hints and what I called a Random McNally map, I sallied forth toward the north pass and made an educated guess as to where to turn from the “main road” onto a dirt track, hoping for the best. The north pass into Saline Valley crests at about 7,000 feet at the north end of the Inyo Mountains and descends through several interesting canyons before breaking out into one of the largest enclosed basins (what geologists call a ‘bolson’ rather than a valley) I had ever seen. To this day I have a very clear recollection of the impression it made on me as I got my first glimpse of the big picture, slowly crawling over a rough dirt road that appeared to stretch out before me endlessly. It was in fact not endless and was quite accurately named Three-Mile Grade. A lone cumulous cloud in the shape of a beehive stood square in the center of the valley no higher than the Inyo mountain range to the west. (I find it curious that for all I have forgotten, I remember a silly detail such as this.) For all appearances, I had the impression I might be the sole soul in this valley. In the distance I could see a lake bed that appeared to have water along its western edge. On my way down the grade, I spotted a somewhat sizable rock on the west side of the road where a tributary “road” took off into the unknown, which had a sign painted on it reading: “Inyo Queen.” My thinking was: there must be an interested gal up that road and I wonder if she is lonely? 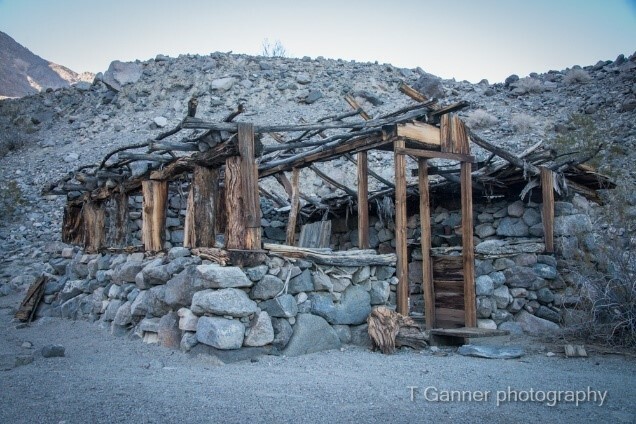 (Turns out that side road leads off into several interesting side canyons, including a mining mill site named Bunker Hill which served the Inyo Queen mine. (A mill site is where the miners live and tend to their mining equipment and such.) A fellow by the name of Art Lawrence, aka ‘Hard Rock’ and his brother Carl were the miners who seasonally “worked” the Inyo Queen. Art was an interesting fellow whom I got to know through the years who was convinced he could create “negative gold” by reconfiguring the electron configuration of lead … a true alchemist with no idea whatsoever of chemistry. The Bunker Hill mill site is still intact, though empty as a result of locals high-grading the contents away.) More information on this location can be found in the footnotes. 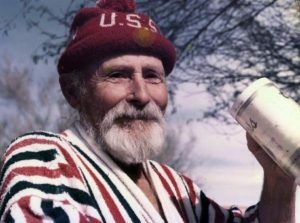 Paul Wopshall at his cold pool back in the 60’s. This is a scanned image of a picture of a photo. 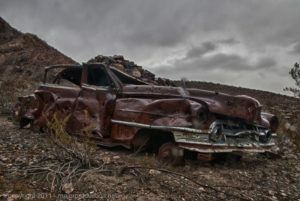 While I was sitting marveling at the irony of an oasis in the middle of so much nothing, (no more cabin) I was taken by surprise to discover I was not the only soul around, as a vehicle pulled in through the mesquite lane and parked nearby. Another lone traveler, I engaged some conversation with the youngish man who inquired if I was here for the hot springs. Hello? Hot Springs? Tell me more! 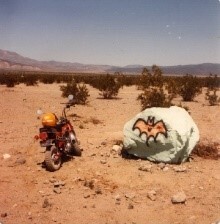 I was instructed to head back north along the county road, beyond the sand dunes I would find a large painted rock with a bat included in the mural. Turn right, and head up the road about eight miles. Alrighty then. Meanwhile, there was ground to explore. I decided to head for the rumored springs the following day. I first wanted to explore this canyon that showed traces of water emerging from its mouth. I made camp in the tamarisk trees just shy of the dunes, that is now owned by Marilyn Moyer, and at that time owned by some fellow by the given name of Trailer Rich. It was a pleasant night in a verdant corner of an otherwise bleak though dramatic landscape. The accumulation of soft tamarisk needles was a welcome respite from the alkaline and rocky soil of the valley floor. I took advantage of the time alone to make a stash of pan bread for the days to come. The following morning, I packed up camp into my armored turtle and proceeded up the road toward my next destination. This destination, as it turned out, bears the name of McElvoy Canyon, though I knew this not at the time. Nor did I know there was a road that branched off the county road and led to a point near the canyon’s mouth. As such, I parked along the road, and headed up the alluvial fan on foot toward the telltale green. Here is where the story gets a little more interesting. (Hard to believe, I understand.) As I am moving up the fan, I happen along a very large boulder, and in the shade of the boulder are numerous mason jars filled with a black gooey liquid that upon inspection has a taste between molasses and honey. Putting my wonderment to the side, I proceeded up the fan, into the wash, and eventually found the paradise that was (‘is’ until recently) the fern grotto, where a transept waterfall and shower gently watered a wall of maidenhair fern. I have come to discover, and have seen, desert orchids bloom amid the ferns in the spring season. Footnotes on the Beekeepers of McElvoy. I get so lucky? Curiously, he introduces himself as Lucky Rich, and he lives at the springs. I tell him of my recent adventure across the valley, and ask about the cache of mason jars I found, and Rich tells me I must have found a stash of honey left by the bee keepers of the canyon. (More on this shortly). And how about all those water bottles cached along the road? Left there in case of emergency should someone’s vehicle break down and maintained by local volunteer action. (Apparently in some years past, a few folks along the way had died in hot weather with a vehicle malfunction. Road traffic was often very sparse in the early days.) While sitting there talking with my new-found friend, a wizened little man with white hair and beard in a straw hat and nothing else walks down a path off a nearby rise, through the mesquite, and (unrealized by me at the time) recognizes that I am taking up Rich’s valued “alone” time and offers to give me a tour of the grounds. The Inyo Queen mine and Bunker Hill. One finds the mill site easily enough by driving up the Three-Mile Grade, and toward the top of the grade, there is a side road, fairly visible, which heads off in the direction of the Inyo Mountains. This road also leads to Paiute Canyon (oldest rocks in the valley are found here) and Lead Canyon. The road to Bunker Hill is a side road that heads off to the right when you find the old Cadillac. 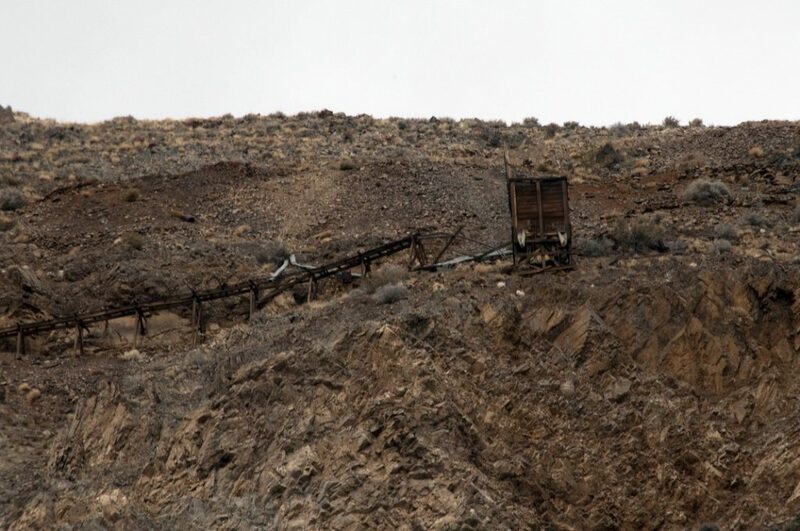 Some years back the BLM planted a gate and steel guard posts to block access to the mine and mill site by vehicle, but someone with a torch has removed the gate and cut the baracades away to a rather exact width of a Samurai (as explained to me by a Samurai owner) and the contents of the mill site are now completely missing. Though empty of artifacts, I would like to share some photos of what remains. 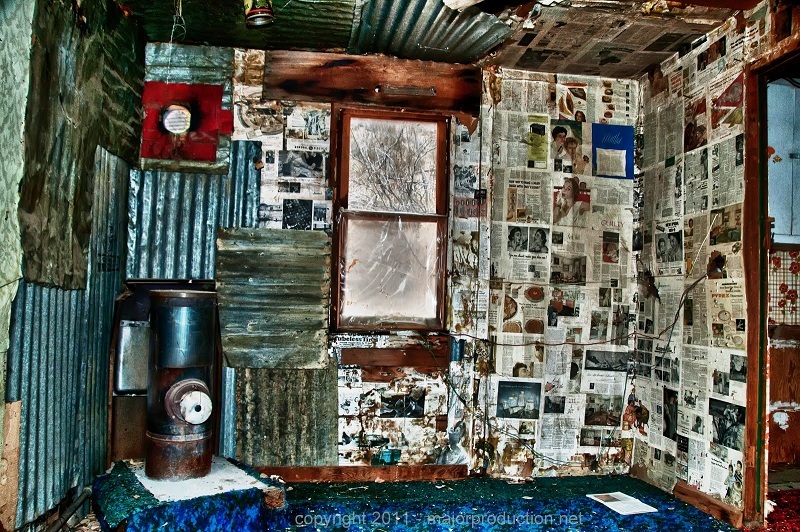 The interior of Art’s cabin. Plywood in the far room covers the shaft below. 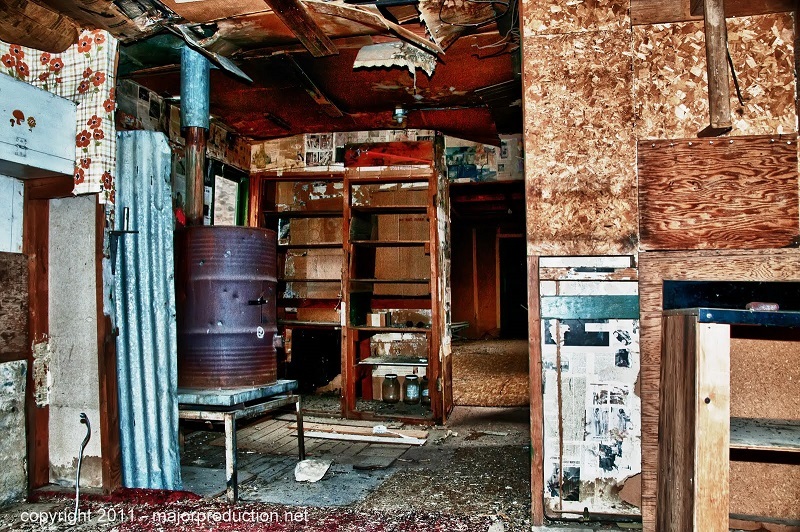 The interior of Art’s cabin. Decorative wallpaper still hanging. Relics of mining engineering and ingenuity. 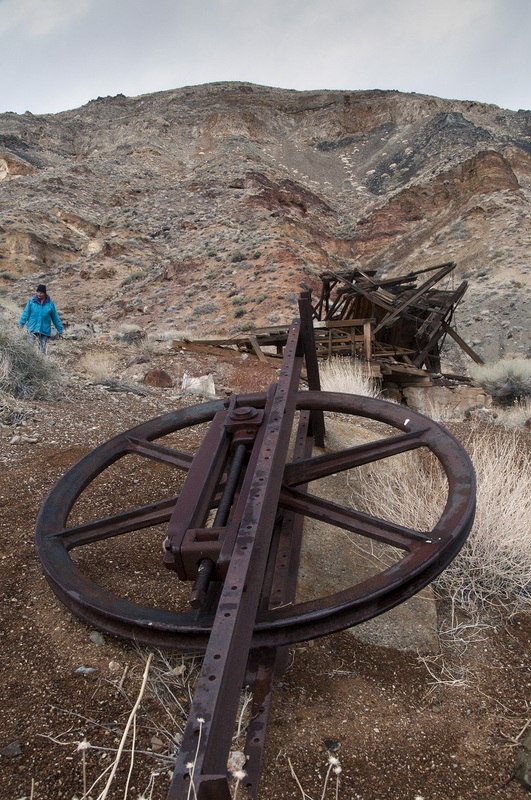 Look just under the top of the hill to see the diggings of the Inyo Queen mine. The attachment is in the 70’ is how I got gold. Ask yourself why would anyone build a cabin, are as it was then an office of sort over a vertical shaft? When I lived in that cabin it had doors a far room was a bedroom that Mary used and it had a wood stove. Kitchen also had a wood stove. 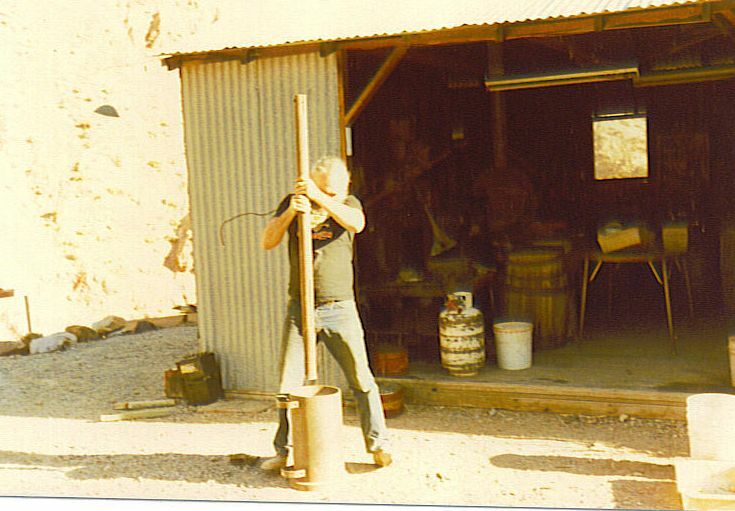 We used kerosene gas lamps and two 25 and 5 gallon propane bottles for our stove and the work shop. Follow that path for a mile or so you would come to a crystal mine that was rather shallow hole dug into the mountain maybe 30 feet or so, beyond that it had caved in years before. But I could back pack in enough that in the summer, Mary, my son and I would camp there because it was so cool. Can you imagine what it was like when we would get to town? While at the springs during my initial stay, speaking of the “honey” cache, a fellow camper who professed to be a new age healer (Stuart Watts, are you out there?) suggested it must be creosote honey, as it is the only plant that blooms along the fans on the valley floor, and therefore was a blood purifier, in turn being a cancer preventative. Say no more! Leaving for Death Valley a few weeks later, Stuart and I travelled together out of the valley in the company of a seasonal resident by the name of Phyllis and we stopped by the location to collect some of this miracle cure. There was more than we could possibly take with us, and we took what we could. After Stuart and I proceeded on, Phyllis returned to camp, where she eventually led the rest of the camp to the location and the remainder of the “honey” was collected and removed. Through the years, I used the honey as a sweetener in my coffee. I found much of it tasted more like molasses than honey, and much was somewhat intermediate. I can attest, down the road, that this concoction does not prevent cancer. 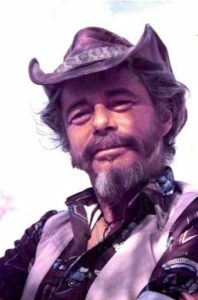 Additionally, a local resident of the valley, Alan Akin, who knew Marion suggested the honey was likely made from rabbit brush higher in the canyon and not creosote. I am happy to still have one jar of this dark elixir stashed away as a memento of days gone by. 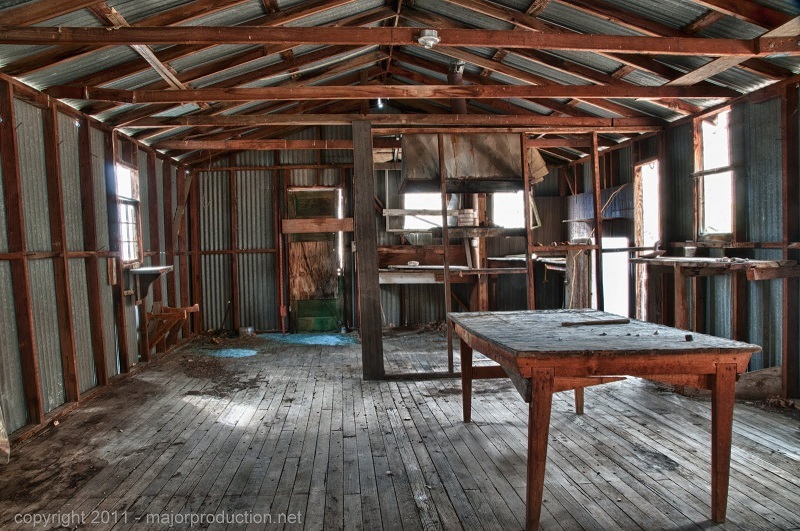 A few pictures of the “cabin” at the mouth of McElvoy. 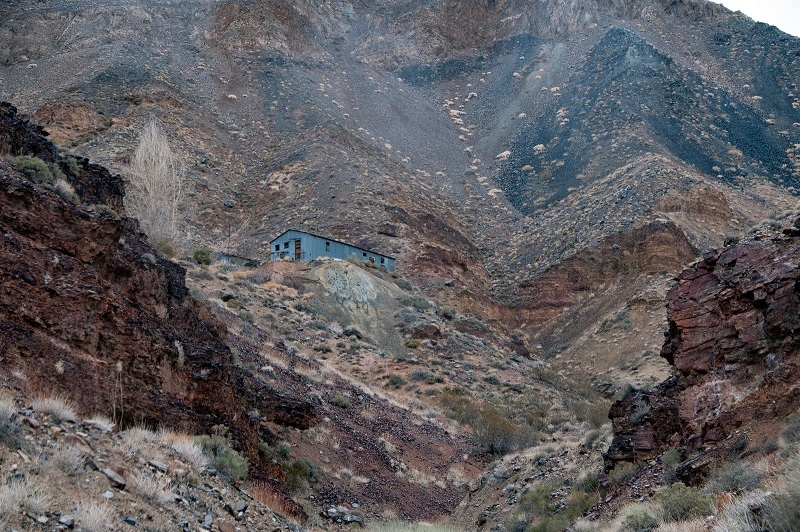 The shingles on the roof made this a particularly unique desert cabin, as most cabins one finds has metal roofs. Hey Tom, I lived in Beverage Canyon from 1971 to 1975 with Jackass Andy. We first lived at the artesian well. Then we were at the talc mine when I was pregnant. We moved to Beverage Canyon when David was a couple of months old. I love reading about the place. You describe things nicely. Hope to hear from you. Great to hear from you Dorci, and thank you for the kind words. You are one of the folks I consider to be “old timers” of the valley, and you certainly predate my arrival. I understand from legend that Andy actually had his nickname used on his Texas driver’s license. Any truth to that rumor from the way-back-when? If you have stories to tell, please consider sharing them for the companion volume. Did you know Corbett Upton or Mary Wopshall? Cheers!!! Hi Dorci. This is Frank. I don’t know what name you might have know me by but I used to hang out with Rocky when I met you. Big Al took a photo of us in the main pool holding a can of Colt 45 back in the Early 70s. Glad to know your still kicking! Tom and Carolyn. I believe your endeavor to hold the thoughts and memories of Saline is a a calling. Just the beginnings of your musings are not juat tales, recollections, tripping, but the discovery of ones place on this planet. Your invitation for us to join you on a long weekend was magic. Traveling into remote desert wilderness is our nurture and Saline Valley-for two born and raised Californians-was unheard of. Off we went from Bishop 395 to back roads, hot springs, wind storms, mountain vistas, crystal starry nights, rigorous hikes. On our exit to the south valley we followed endless desert vistas, historic tailings and frozen dreams. We climbed the ridge to incredible Joshua trees barely visible through blinding snow storms and cliffs we weren’t sure if we could maneuver or dive to our deaths! Exit on the highway to choose east or west and compared the parallel universes of Death Valley. Our frozen memories come to life every day that we see one of your photos of the red mountain peace sign and oasis. Thank you for a place in our hearts as friends and fellow travelers. Keep writing for our memories and the roads we have traveled and shared are the best of our lives. What a great recollection! Thank you for sharing the love. HUGS to you both. As always – fascinating. So well done. It’s nice to read of your love for the place. We took one trip to Death Valley, and I found it to be way to stark for me. So – good to read of your findings. I recall when I was a child growing up on the east coast, my folks had a book on the shelf entitled “A Twist of Sand” and showed a human skull lying on sand. 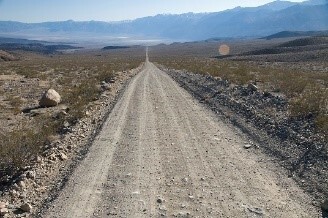 It made an impression on me, and I thought the last place I would want to see is a place called Death Valley. When I found it, I did a 180. It is perhaps an acquired taste. It is a land composed of ugly things (it will bite, sting, poison, abrade, you name it) where little flourishes to our otherwise accustomed eyes, but all these little hard-edged things combine to transcend their ugliness into a stark beauty that called to me from very deep places. Changed my life. I remember many nights standing upon a rise and listening to a silence that had a presence that noise (such as a distant wind making its way around the desert basin) could not touch. Those who have spent time in these bleak places know what I mean, I am sure. Thanks Sam … both those topics are definitely planned. The trickle is a stream for the foreseeable future. I hope to bang one out about every two weeks. Thanks for the recollections, Major Tom! 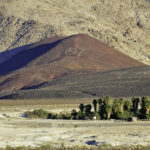 It seems there’s a lot more to Saline Valley than initially meets the eye.